In 1952 Herb & Keith Gilmour recruited interested boys from the Epping Public School and West Epping Public School, standing outside these schools and distributing pamphlets to interested boys to take home to their parents. The notes invited the parents of children interested in playing soccer to attend a meeting at the home of Herb Gilmour one midweek evening. Subsequently, about 8 boys aged between nine and twelve assembled at Epping Oval for the first training session on a midweek afternoon in March 1953. Within a couple of weeks sufficient boys had shown interest to make up a team. The team was named “Epping” and this club later developed to become the Epping Eastwood Football Club we know today. Whilst this was only one team, the Hornsby-Epping Soccer Football Association had been born. In 1956 the Association changed its name to Northern District Football Association to accommodate the teams joining from beyond the geographical boundaries of Hornsby to Epping. The growth was so rapid to the south that in 1959 it was necessary to again change the name to Gladesville - Hornsby Football Association. 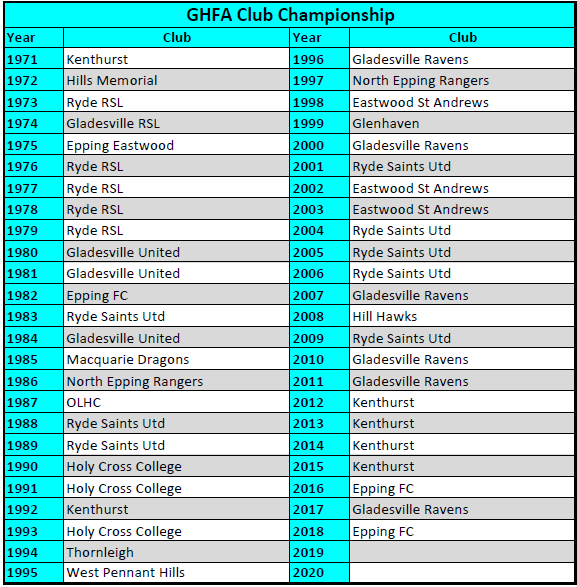 Since those early days, the Association has grown to its current 30 clubs and over 12,500 members, and has incorporated a representative club, GHFA Spirit FC.